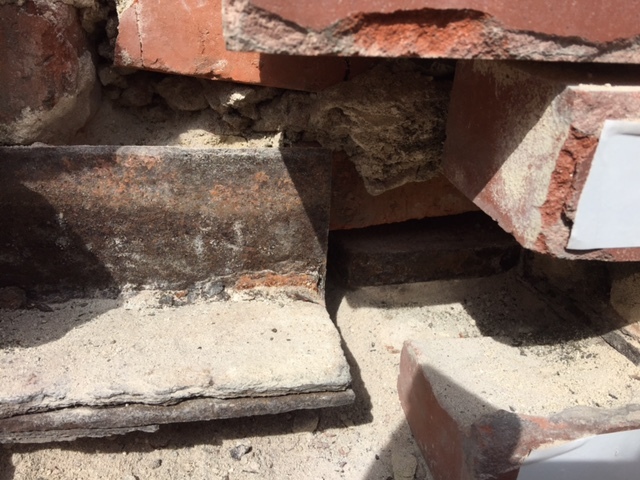 Since the last post, the Historic Preservation Team has been working with our consultant John Fidler (of John Fidler Preservation Technology Inc) to move the project forward. Work is to begin in March of 2019. 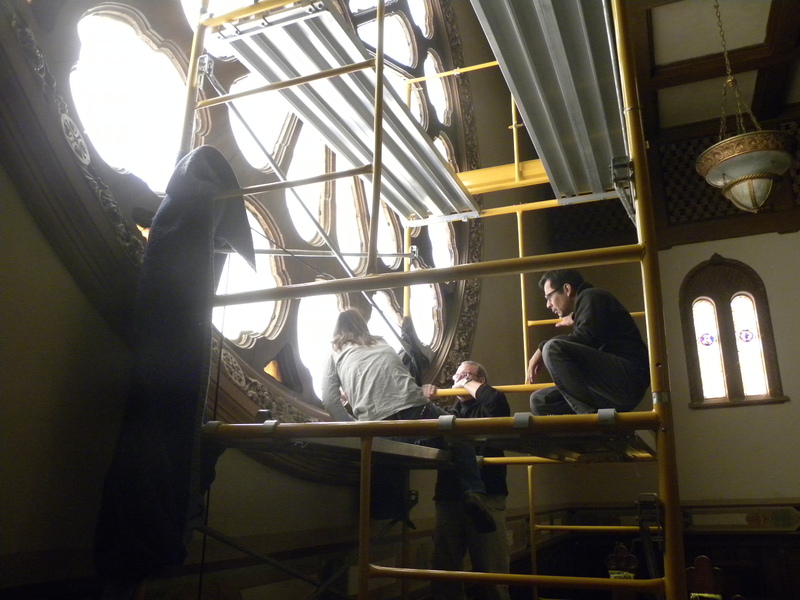 The Preservation Team gratefully acknowledges the support and patience of the First Church Community in this process. Here is what has been going on. 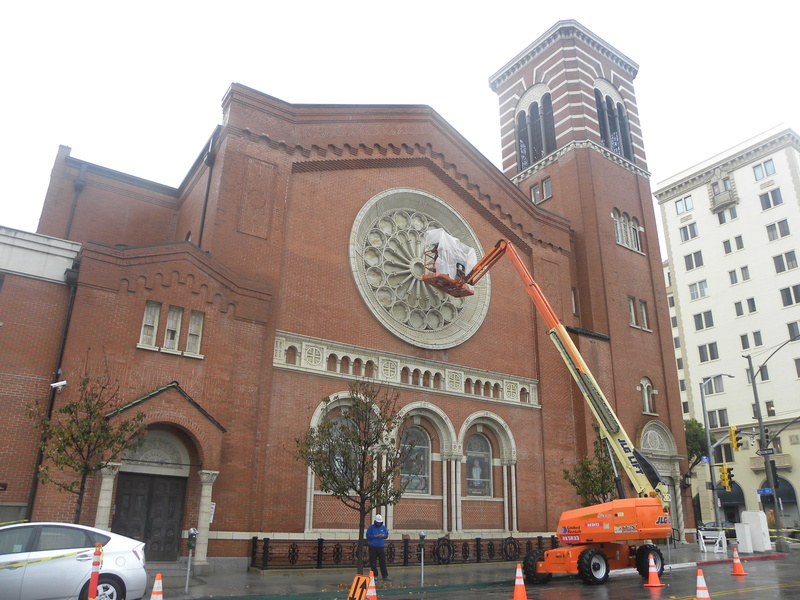 The scope of the project was modified to focus on the east façade, including significant terra cotta replacement and the repair/reinstallation of the Rose Window. 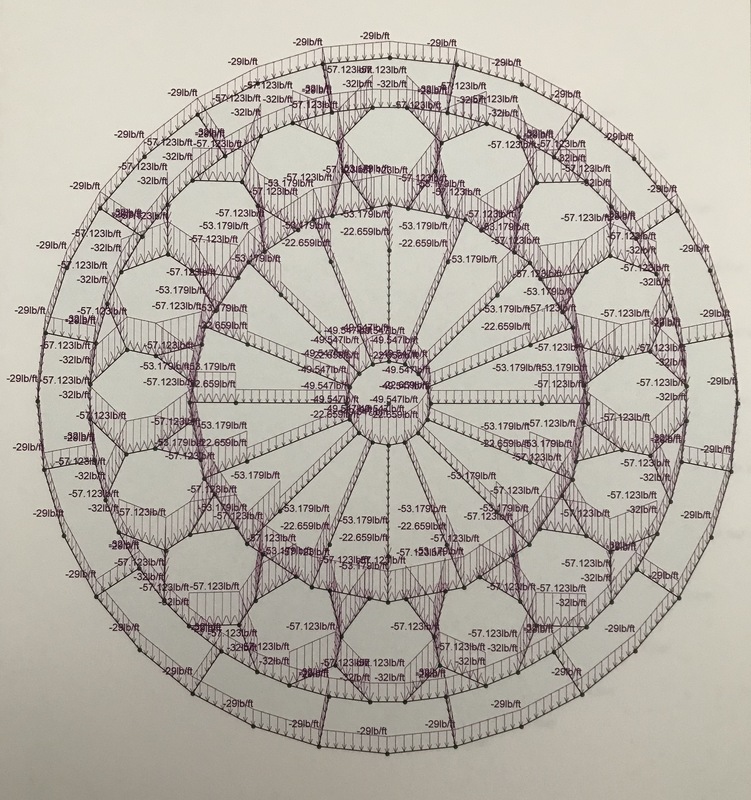 With the help of John Fidler’s organization, a detailed project manual was created to serve as the key document in procuring bids from contractors. A three-month bidding process was conducted to find bids that would align with the 1.8 million cost approved by the congregation and Church Council. A contract was formalized with chosen contractor Giampolini & Co, Inc of Emeryville CA to complete all the work outlined in the project manual. The anticipated length of the project is 12-14 months. Permits were sought for and obtained from the Planning Department of the City of Long Beach. Scaffolding will be placed on the interior and exterior of the east wall in March. The interior portion will be covered with a decorative box to improve the aesthetics and provide some sound proofing. A detailed construction schedule is being formulated. Regularly scheduled meetings between John Fidler, Giampolini &Co construction, and church representatives will occur to coordinate the project’s progress. Samples of our cracked terracotta have been sent to several terra cotta manufactures (including one in Great Britain) to find matches of the color and texture. Final pricing and delivery information are also being requested. Once a signed contract is in hand, arrangements will move forward with the UCC Cornerstone Fund, the organization helping us finance this project. Our church’s Development Committee is working on finding and submitting grants to aid in the project’s funding. 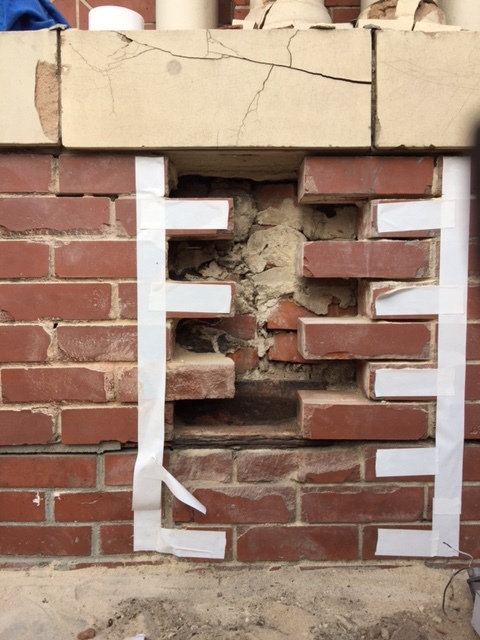 Until the terra cotta is removed, we won’t know if our plans on how replace the currently rusted metal anchors and armatures are correct. Once construction has started, hazardous materials from the original construction might be discovered. If so, their removal would be dealt with in an appropriately safe manner. A few spaces will be lost in the Chestnut parking lot. Already a container has been placed there and a portable office for the project might fill three other spaces. 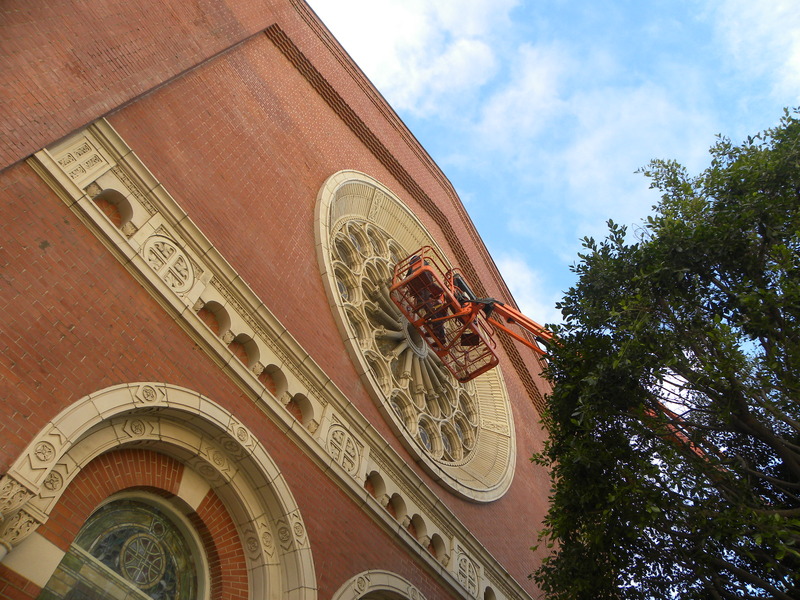 The temporary glass in the east rose window will be removed and the opening will be sealed for weather protection. 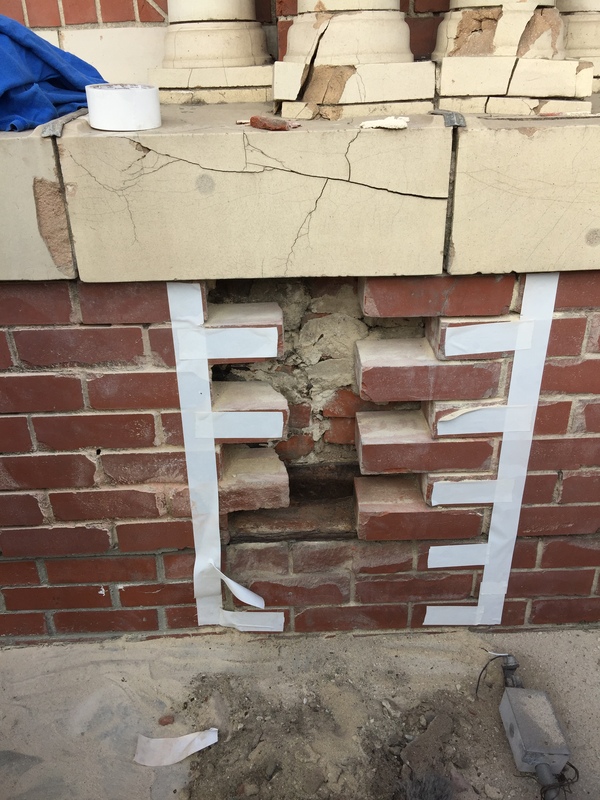 The light will be blocked until the replacement terracotta is ready to be installed. 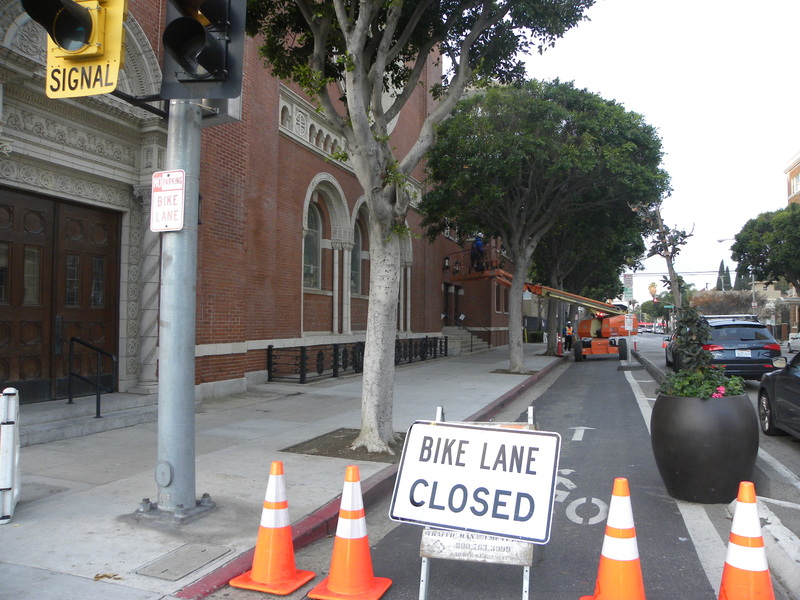 The parking spaces immediately in front of the church will be lost due scaffolding. We will maintain space for drop off at the entrance of the courtyard and a few metered spaces on Cedar south of the scaffolding. The spaces in the Potholder lot will still be available (5 slots during the day and the whole lot after 3 pm), as well as the city and 3rd street lots. The Chestnut lots will be open as well. Scaffolding will be erected on the exterior of the east side and the interior east sanctuary balcony. The sidewalk will be protected by a covered walkway. The exterior scaffolding will be wrapped and secured with locked access for the contractor’s crews. Worker’s access to the church will be limited. They will have entrance through the coffin doors and be able to use the restroom via the walkway behind the choir loft. Their access to the east balcony will be limited. Construction will take place on weekdays, but not on weekends or holidays. Working hours will typically end by 4 pm. Through all of this, we will strive to impact the church as little as possible. We will also try to keep everyone informed as best as we can. Those of you who attended last Sunday’s service may have felt like you were in a hell fire or a hot-yoga version of church but that is the building’s natural state, no air conditioning. It was a shorter service with typically low attendance, many at or avoiding the Gay Pride Parade, so it seemed like a good time to experiment. Wrong. Church members were sweating, an overheated woman left in the middle of service, and the organ pipes went out of tune. We learn from our mistakes. 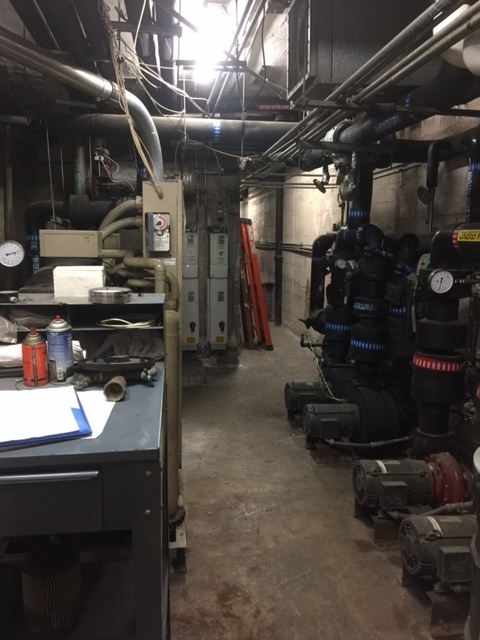 In this post I want to take a closer look at our air conditioning and show you the guts that make this building an icebox or an oven. The interior of the boiler room. Contains the controls, pumps, and the intake/outtake pipes for the ice bank. The current hybrid system was put in place with the retrofit in 1988. Underneath the courtyard is an ice-maker that is now run only on the hottest of days but was originally used every night. In the morning when the cold air was needed, water would be pumped over the ice to cool it. The cooled water would then be pumped around the building where fans could blow over the cool pipes and create cold air. Now we use chemically refrigerated water most of the time but the ice system still functions. 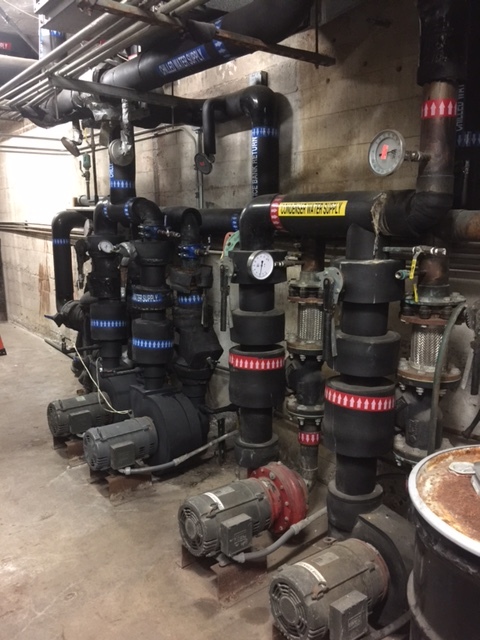 Hot and cold water pumps. In 2002 when the new building was added the volume of cool air needed was effectively doubled but no new capacity was added to the old system. The logic was that both buildings were rarely used simultaneously so one system could serve both. Unfortunately lived experience tells us that is not the case. 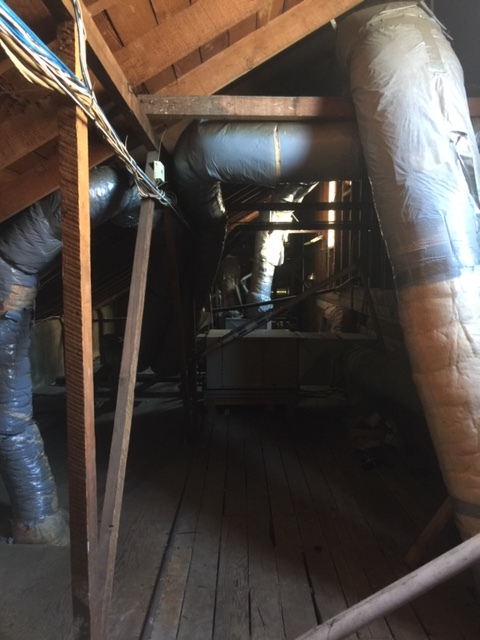 Attic duct work over second floor offices. 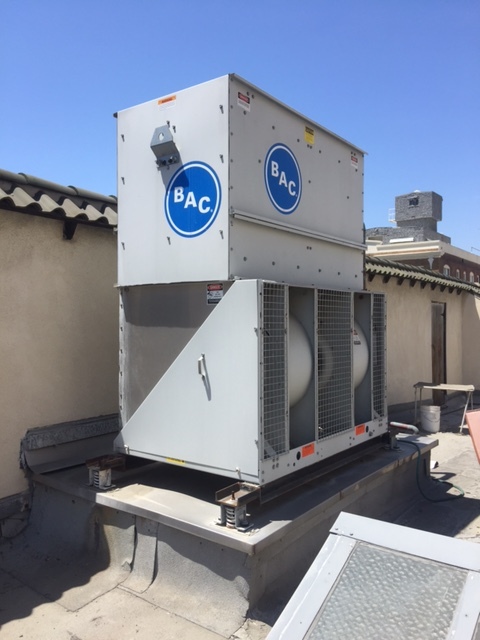 The Port of Long Beach is offering grants to local organizations that serve children to address their air conditioning problems with the intention that high quality filters will be installed to pull out the harmful particulates emitted by the port. Yvonne, Sam, and I are currently exploring options to take advantage of this wonderful program to improve our system. We will keep you posted on our progress!